How to export from Kazakhstan? What are the export registration procedures, export customs process, export cargo movement methods in Kazakhstan? Explain the export methodology in Kazakhstan. Information given here explains about step by step procedures that need to be finished with Kazakhstan government authority for exportation from Kazakhstan. For commercial purpose, a registered trade with concerned license (if required) as per the business and have enlisted in the Trade and Company Register of the country is must for exporting and importing of goods from and into Kazakhstan. Any legal entity who has registered with tax department of Kazakhstan can start appropriate business and engage with international trade by fulfilling necessary requirements by the Government of Kazakhstan. The State Revenue Committee of the Ministry of Finance of the Republic of Kazakhstan is a department which carries out regulatory, trade and control functions in the sphere of customs affairs like managing inflow and outflow of goods in the country, levies taxes, and facilitate genuine trade. This post explains about different phases in export process that every exporter needs to go through for completing export from Kazakhstan. Help to export from Shymkent. Procedures required to export from Aktau. Requirements to export from Shymkent. Clarifications to export from Shymkent . How can I export from Shymkent. What should I do to export from Shymkent. 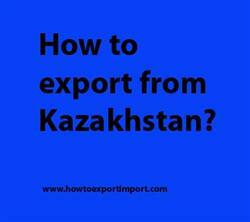 How to export from Karaganda? Formalities to export from Kostanay. Procedures to export from Shymkent. Need to export from Shymkent . Explain to export from Kostanay. Information to export from Atyrau. Step by step process to export from Aktau. Methods to export from Karaganda. Guidelines to export from Astana. Please guide to export from Shymkent .